Just regular dudes and adoptable rescue pups living out loud. There’s a surprising amount of “hot guy and a dog” wall calendars in the world. There’s “Hot Dudes with Dogs,” Hot Guys and Baby Animals,” and even “Furrever Hotties,” which pairs chiseled Chippendales dancers with tiny kittens. (They’re truly quite small.) Local rescue animal photographer Ricki Beason recognized the “hot guy” saturation in the wall calendar market, and decided to swap out the ubiquitous hunks that would normally grace her annual “Hound Dogs and Heart Throbs” project and rebrand for 2019 with a more relatable figure: the dad bod. “I wanted to do something different that might revitalize your need for a wall calendar,” says Beason, who donates the proceeds to local animal rescue organizations: The Love Pit, Rescue Row and Astasia’s Angels Animal Rescue. 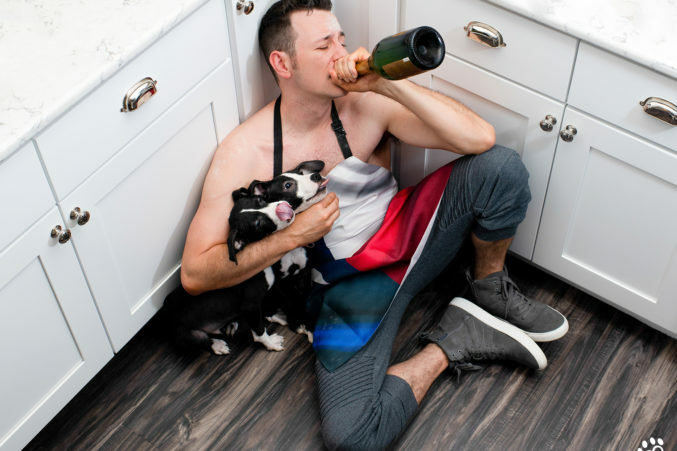 A new, humorous approach to the man-plus-dog calendar isn’t just a way to drum up more sales and publicity (“Dad Bods and Dogs” has already been written up in the Huffington Post and Today.com), but an opportunity to put the focus back on the rescues. You can pre-order the 2019 calendar now (they’ll start shipping in September) and join Beason and Session Pilates this Saturday for a Puppies and Pilates event, featuring adoptable rescue animals and brunch with proceeds benefiting The Love Pit, Rescue Row and Astasia’s Angels Animal Rescue. Click on to see the full calendar in all its dad bod glory, and see which Dallas dogs are still available for adoption.